The 0.8%q/q GDP print looked pretty good at the headline level, and the 2.75%y/y (v. RBA at 2.5%y/y) looked even better – but when you dig a little deeper that is where the good news ends. Over the last two quarters, there has been a nice increase in consumption, however this has been offset by slowing investment – and with the outlook for further declines of investment and slower growth in Government spending, consumption will need to keep firm (or net exports will have to keep booming) to keep overall GDP growth around 3%yoy. 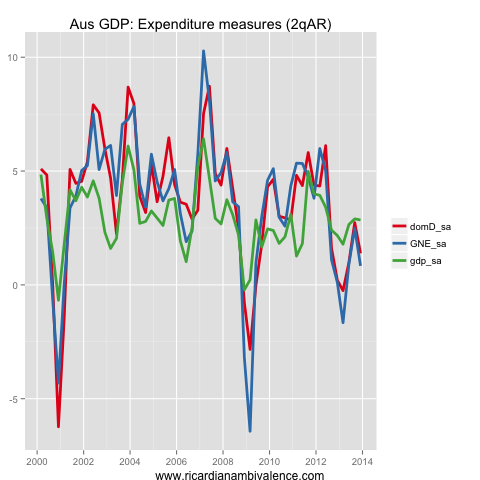 The RBA cannot do much about net exports (reflecting the fact that they have only limited influence over the currency), so they tend to steer policy based on measures on domestic activity. 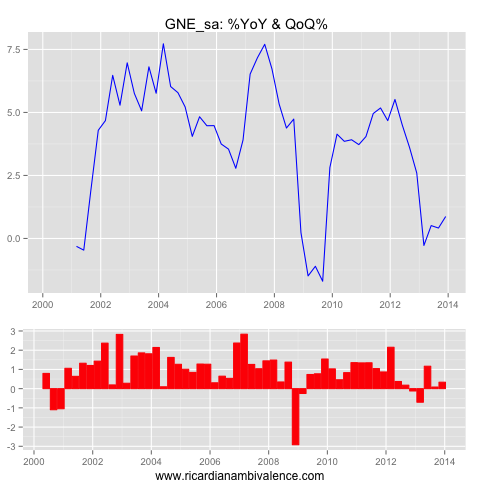 The simplest regression analysis reveals that GNE (DD + Inv) is much more important for policy – and on this measure we remain near recession. Sure things looked a little better the last two quarters, however we remain a long way from normal. I know a lot of readers are interested in nominal GDP – and here the news is a it better – due to a (probably temporary) rise in the terms of trade. It’s up on the quarter, and down only a small amount on the year (note that the YoY % decline was similar to the GFC). 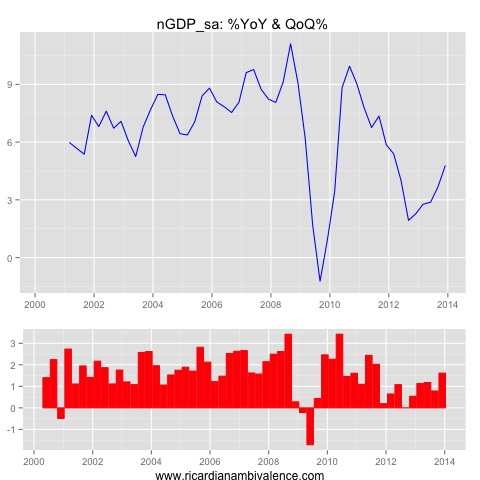 This has boosted nominal GDP a little – though the pace of growth remains weak by historical comparisons. 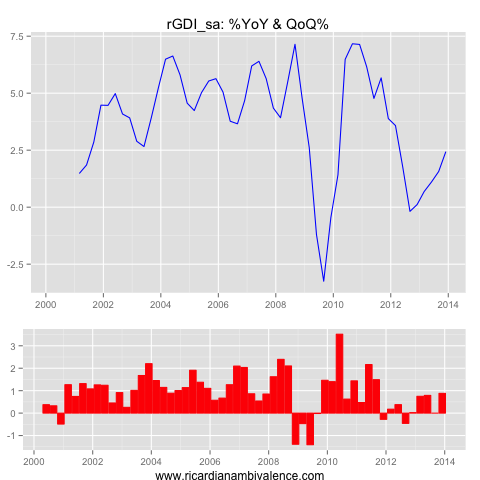 Myself, i prefer read GDI ahead of n-gdp, as it’s less influenced by inflation. Again, this measure shows some improvement, but it’s a long way below normal. Finally, thinking about policy – with the outlook for further declines in the terms of trade, it’s hard to see nominal GDP (or related measures) holding up. And with the bits of the economy the RBA most directly controls (domestic demand and GNE) still very weak, it’s premature to say anything more than that the data remains consistent with ultra-easy policy. I still think the RBA’s next move is back to an easing bias. 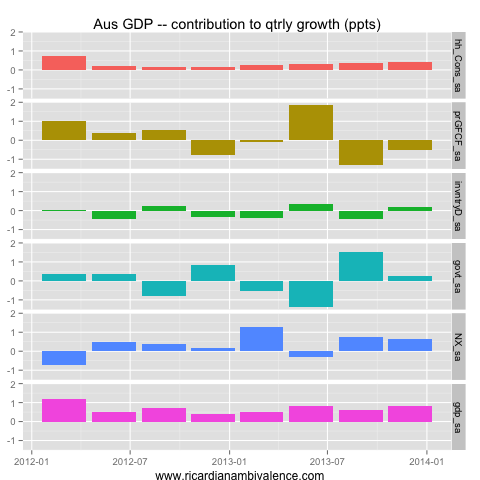 This entry was posted in AUD, economics, monetary policy, RBA and tagged GDP. Bookmark the permalink. Thanks Ricardo. 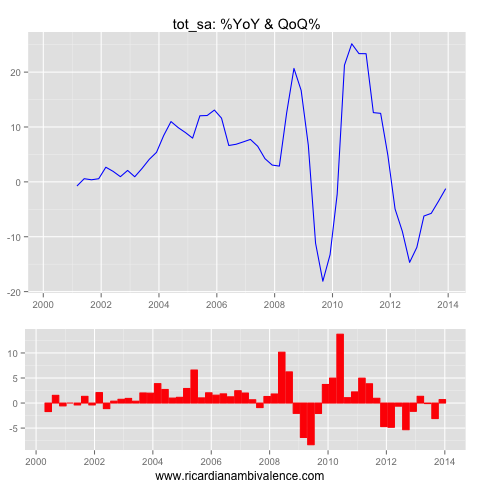 I noticed that inventories contributed about 0.2% to GDP in Q4. Would that be flattering or understating the strength of domestic demand at this stage of the cycle? And I assume you mean ‘real’ GDI..
Strong retail sales.. which is what we need to see.. I have publicised this twice on my blog. Agree on retail trade turnover. i would like to see non-miming investment start to do something as well. Probably have to wait until the currency gets to sensible levels. What’s the State of the Economy?